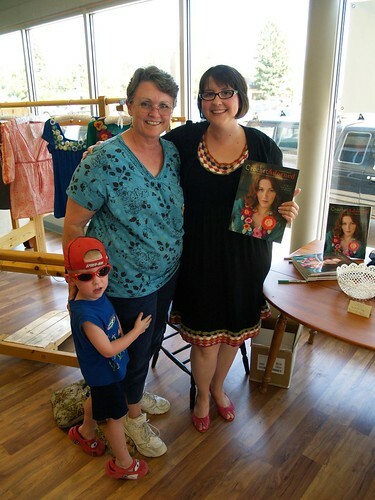 I had a book signing for Crochet Adorned at the Yarn Shop (where I also work) this Saturday and it was great! We had cupcakes, I demonstrated how to crochet a flower, sold some books, saw lots of friends, and got to hang all of my projects out for display. 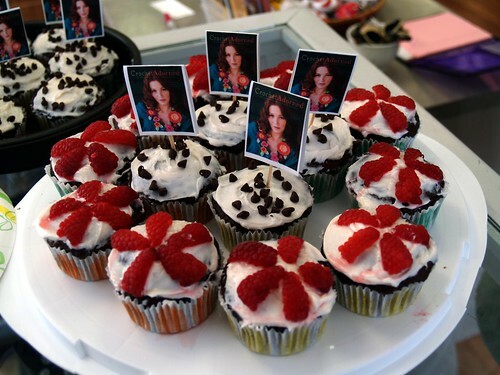 Let’s start with the cupcakes: it’s very important to give people sweets, in my opinion. I made flowers on top of these chocolate cupcakes by cutting raspberries into fourths, then using 5 fourths as petals. And of course, I printed up some Crochet Adorned cupcake picks. Very fun and easy to do. 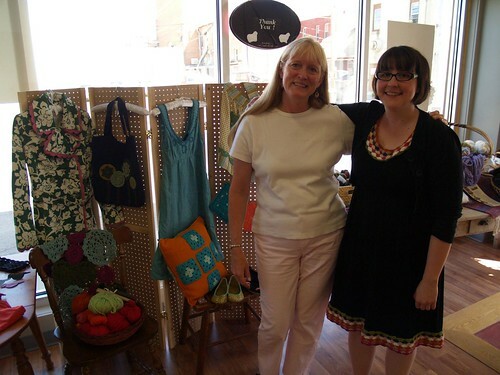 We put all of the projects on display–the shirts above are hanging on an old loom in the store, which makes a great display piece. I was telling Barb, the owner, that I don’t think I ever laid them all out in one place before I sent them off to the publisher, because I don’t even have room in my apartment to do that. So doing that at Powell’s and then here was really nice. I saw lots of friends and met some new ones too. 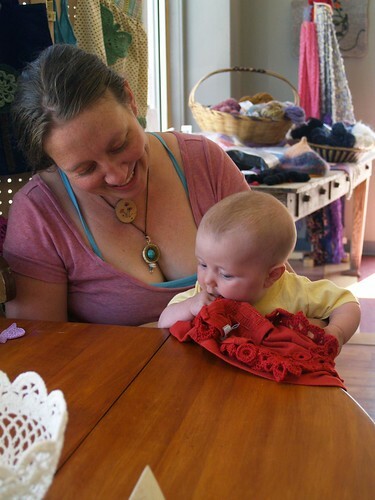 Anabelle thinks that crochet embellishments taste good! She was so cute, I would have let her eat all of the projects. Her mom, Julie, has a blog over here with lots of pretty things, and she’s currently trying her hand at making upcycled yarn–yum! I also finally met Marty (who also blogs here), who brought some of her crocheted swiffer covers (loosely based on this tutorial) to show me. Very cool. There was a steady flow of people throughout my signing, which worked out great. Thanks so much to Barb for hosting the event, and for making some delicious snacks for everyone to enjoy! And a great big thanks to everyone who stopped by– you made my day!! 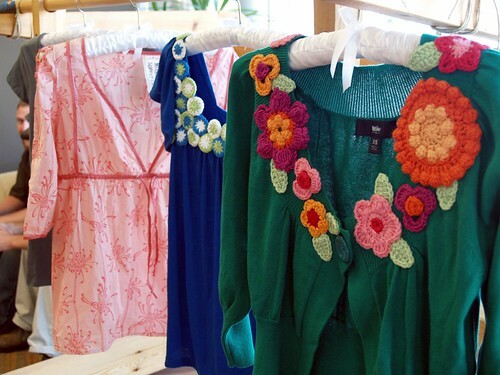 See more pictures at my Crochet Adorned flickr set. There are more signed copies available through the shop if you didn’t get the chance to come by, or you can swing by Borders next Saturday at 2 pm, where I’ll have another signing. As for the interweb book tour, today’s “event” is a guest post by yours truly at the Crochet Today blog. I’m doing a step by step tutorial detailing how to sew embellishments to clothing. The post is up, and it’s also a giveaway post, so be sure to stop by! Love your book! Only one problem, you are sooo beautiful, YOU should be on the cover in your dress. OMGoodnes I didn't feel compelled to make it when I saw it in the book, but now I do! I'm so sorry I missed you when you were in Portland -- my cold was so disgusting and I was so crabby, it was still hanging around into the week but I was so mad not to have gotten to meet you. I am looking forward to getting the book! Congratulations it looks so pretty!